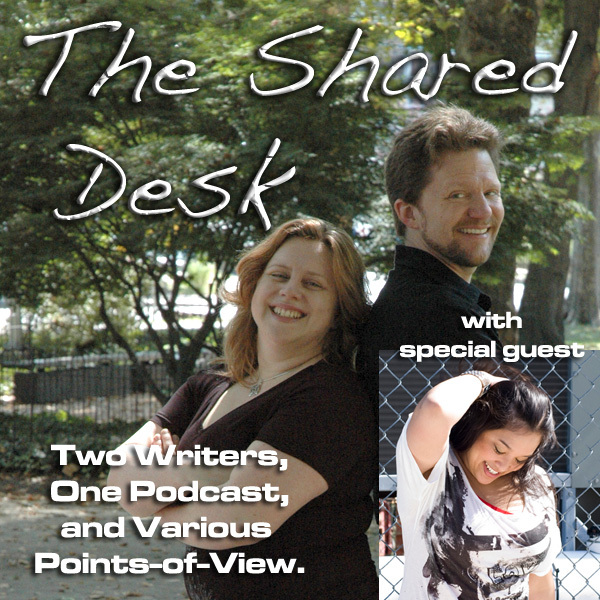 So it’s been a while since we have sat down and recorded a Shared Desk, but how about this — when we finally got a chance to record a Shared Desk, we did it with the lovely P.J. Schnyder. This episode is about tough choices we make as authors in bringing about the demise of a character. Why do we do this to our creations? Is it for shock value? Is it for impact? And do we really care in the end? A brand new Shared Desk, and this time we brought a friend! …or what we remember of Blogworld and B.E.A. Do we create characters simply to kill them? Evoking the name of Joss and when he kills beloved characters in his works. When do authors cross a line? Did J.K. Rowling go too far (or not far enough) in The Deathly Hollows? We do care about the characters we kill. Do we write for entertainment, or to make an impact? Bringing it back to marketing of books — when it works, when it doesn’t, and when it boggles the mind…. What does P.J. do to relax? How does P.J. manage her time? Shout out to Stella Price! Drinks to mix, food to prepare, and stuff to blow up! …and Pip shows up Tee on the Creative Commons tag. Again.